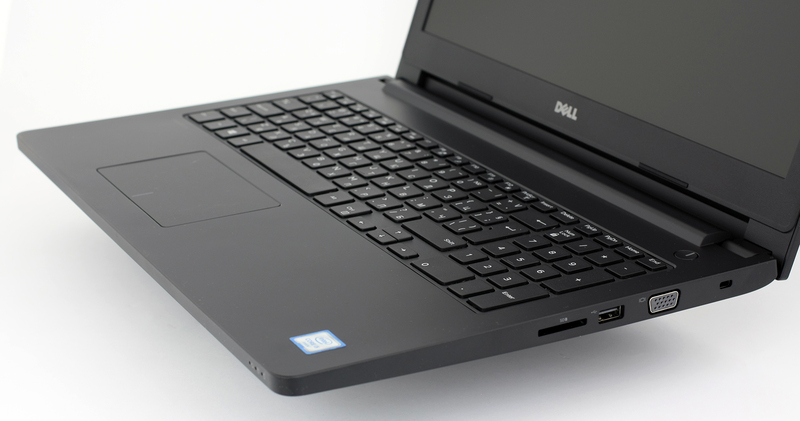 Dell’s Latitude 15 3570 is not your typical budget-friendly business companion. It comes in several configurations and there’s a pretty good chance that you will find what you need to better suit your taste. But whichever model you choose, you will benefit from excellent battery life and in some cases, extra long runtimes. 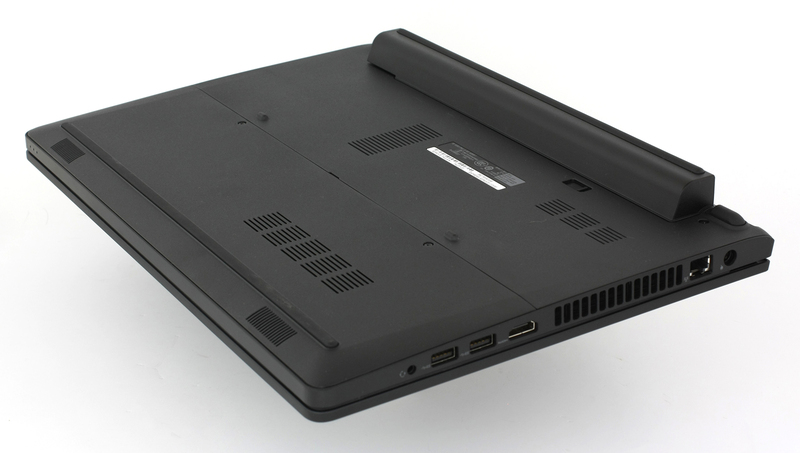 Aside from the big bulge on the bottom of the 65Wh configurations, the notebook sports a pleasant and strict design, limited upgrade options – in terms of storage and memory that is – and decent input devices. Another thing that didn’t quite make it to our pros list is the display but more on that in our review below so keep reading to find out if there are other alternatives worth considering. 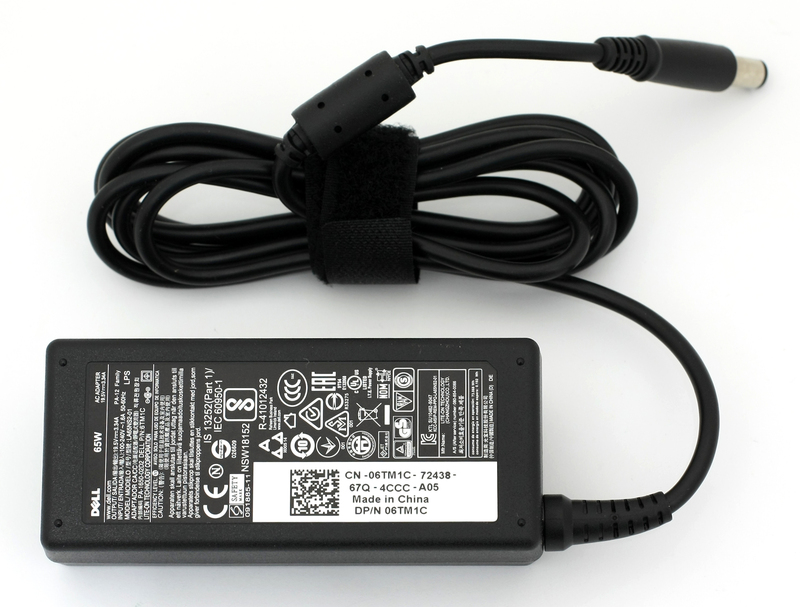 The retail package consists of the usual user manuals, AC adapter and cord, and the notebook itself. 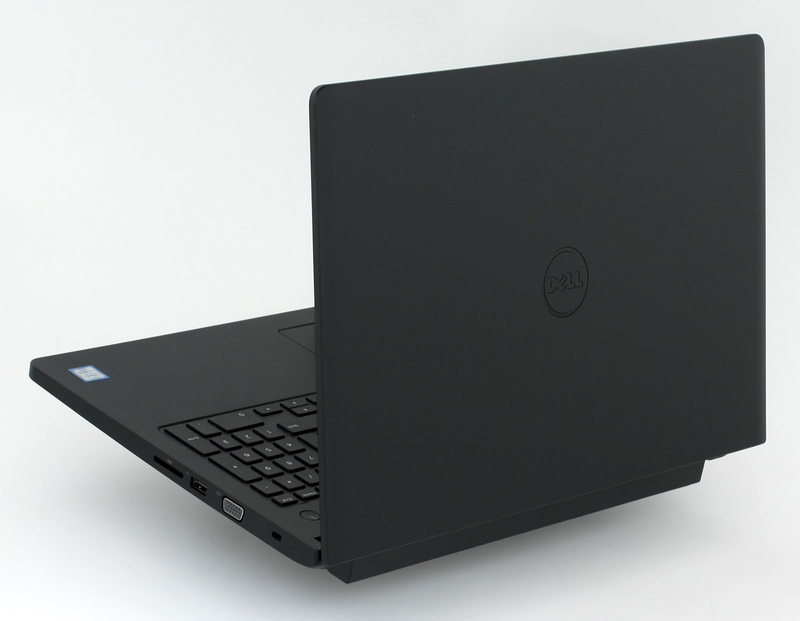 Dell’s Latitude 3570 keeps it simple with all-plastic construction featuring matte surface all-around resulting in a fairly light, compact package – excluding the protruding battery pack on the bottom, of course – and not so sturdy construction in certain areas. Let’s start with the lid, which doesn’t really stand out from the rest of the design. It’s black with matte finish but fingerprints don’t stick. That’s a plus. However, the overall sturdiness isn’t exactly impressive. Bending the center of the screen has always been an issue with lower priced models but in this case, it’s somehow extra flimsy. It can’t be opened using only one hand since the hinges are a bit overly tightened. The bottom features one big service lid that holds the storage, Wi-Fi card and two RAM slots. 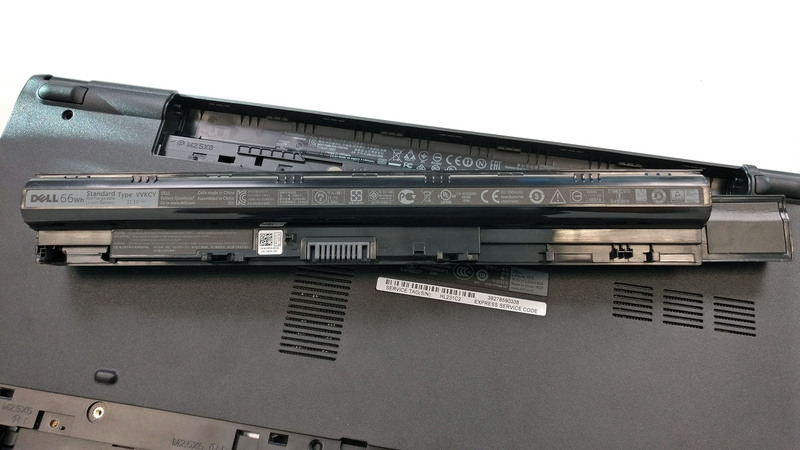 The sides are relatively thin – 23.25 mm and the only thing that might get in the way while carrying around the notebook would be the battery bulge. Anyway, all of the usual ports are at hand – LAN, HDMI, 3.5 mm audio jack and two USB 3.0 ports on the left while the SD card reader, the one USB 2.0 connector and VGA are located on the right. That’s what we call “healthy” port distribution. The interior seems to be a bit neglected for a business-oriented notebook, to be honest. 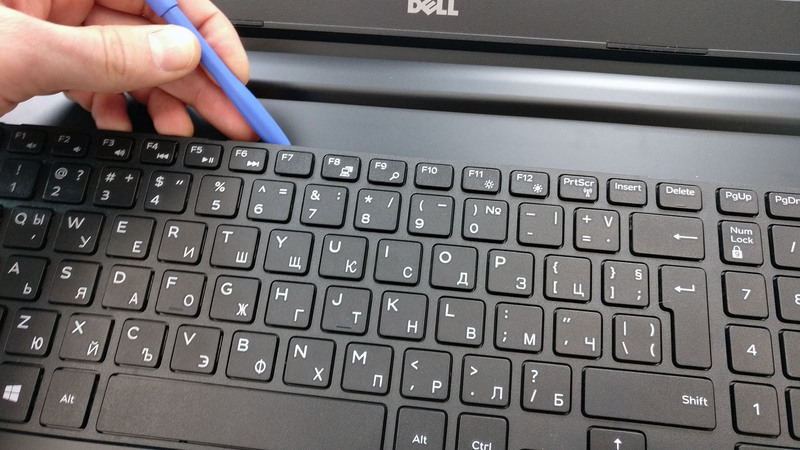 It still adopts the soft-touch matte finish around the keyboard and touchpad but the input devices have some drawbacks that need to be considered. The keyboard features decent travel with little feedback when pressing the buttons – we’ve definitely seen better even in this price range – while the touchpad has slightly rough surface resulting in low precision at times. The clickpad, however, doesn’t wobble and registers mouse clicks correctly. 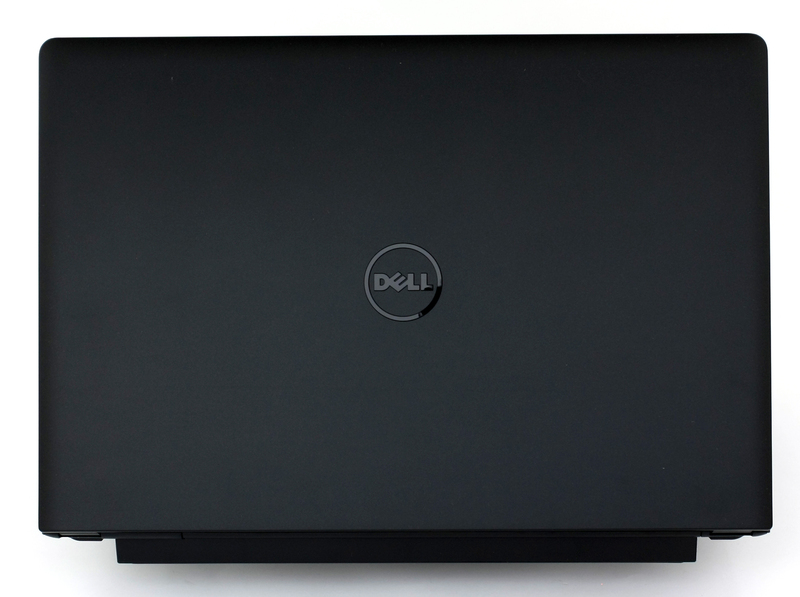 There are some things left to be desired for a business machine like sturdiness in some areas along with a more refined keyboard design but we have to give credit to Dell for designing a fairly thin and light notebook tipping the scale at just 2.06 kg and measuring just 23.25 mm thick. 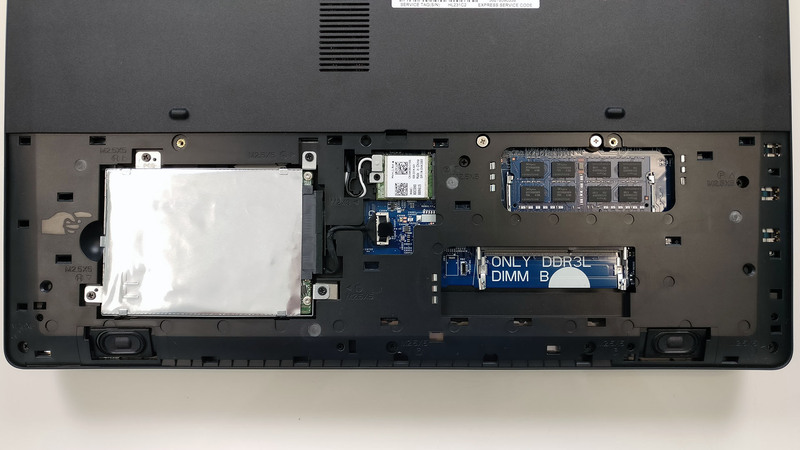 The full disassembly of the notebook is time-consuming and a bit of a hassle but the upgrade options are featured under a big maintenance hatch on the bottom of the laptop. 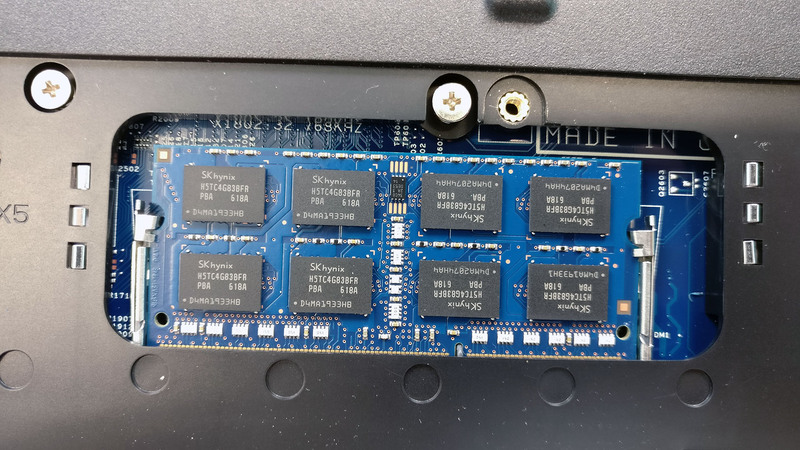 As most budget-friendly business solutions, the Latitude 3570 features only one 2.5-inch HDD slot and doesn’t integrate an additional slot for an M.2 SSD. HP’s ProBook lineup makes an exception regarding storage options, though, so if this is of great importance to you, we suggest snatching one of HP’s newest ProBook 450 G4 laptops. 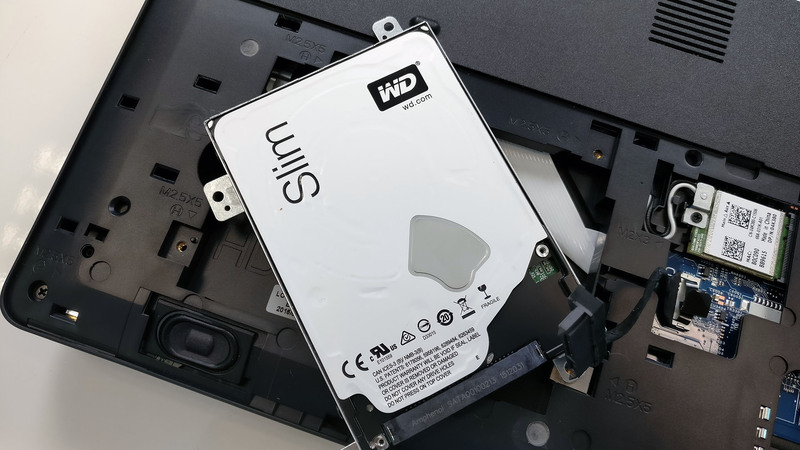 Anyway, the teardown revealed that the unit comes with a WD Blue Slim spinning at 5400 rpm and offering 1TB of storage. The motherboard supports two slots compatible with DDR3L-1600 RAM sticks. 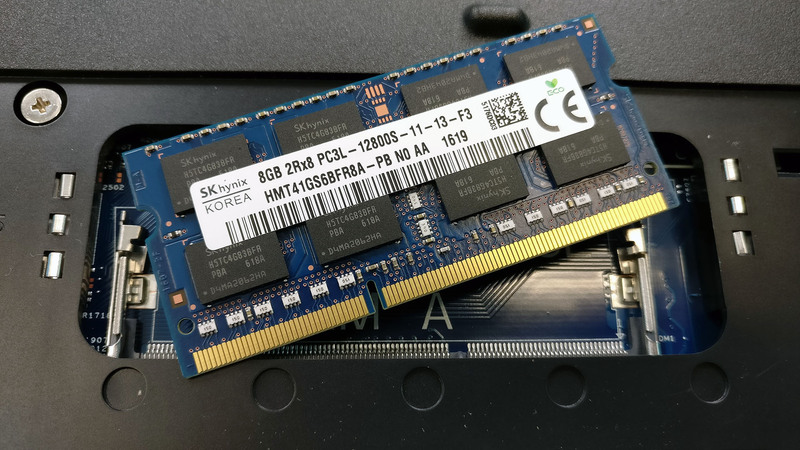 Our unit came with one SK Hynix 8GB chip and the other slot free for upgrade. 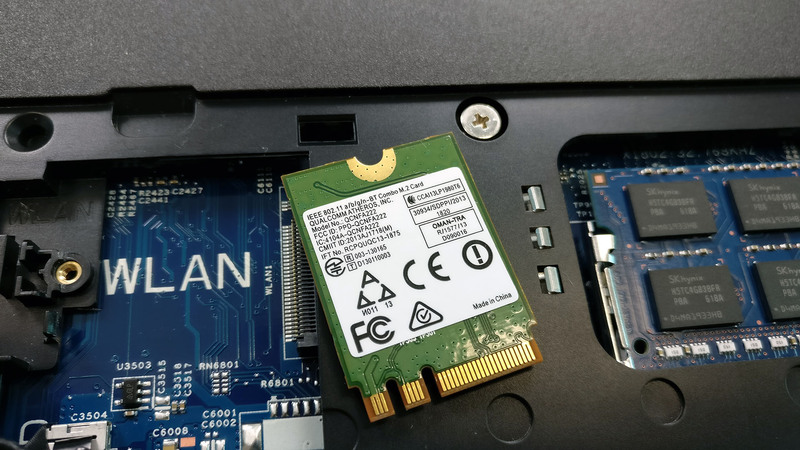 The Wi-Fi module is located between the 2.5-inch drive and the RAM slot. It’s a Qualcomm Atheros with model number QCNFA222. 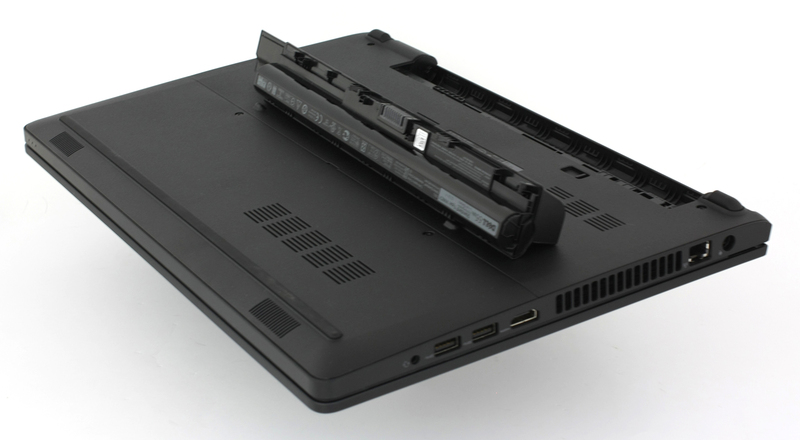 The battery is user-replaceable and can be easily detached by pulling the lever switch. It’s rated at 66Wh but you can order a configuration that doesn’t feature the big bulge at the bottom but limits the capacity of the unit to 40Wh. 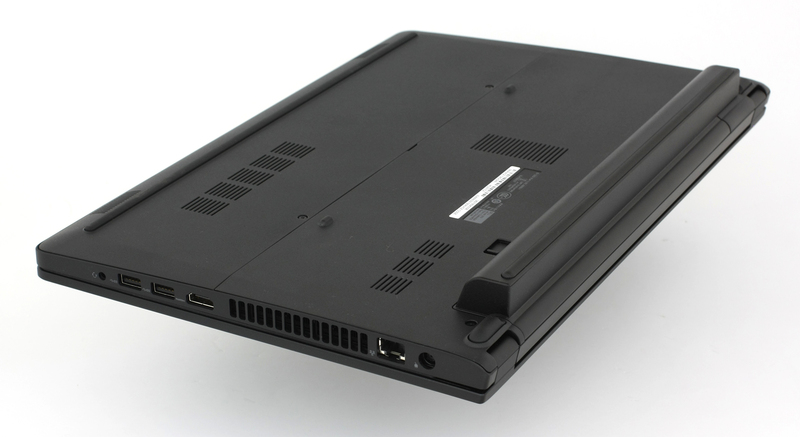 The cooling system is simple and consists of one big fan located near the left side of the notebook where the main exhaust vent is. One heat pipe takes away the heat from the chip. 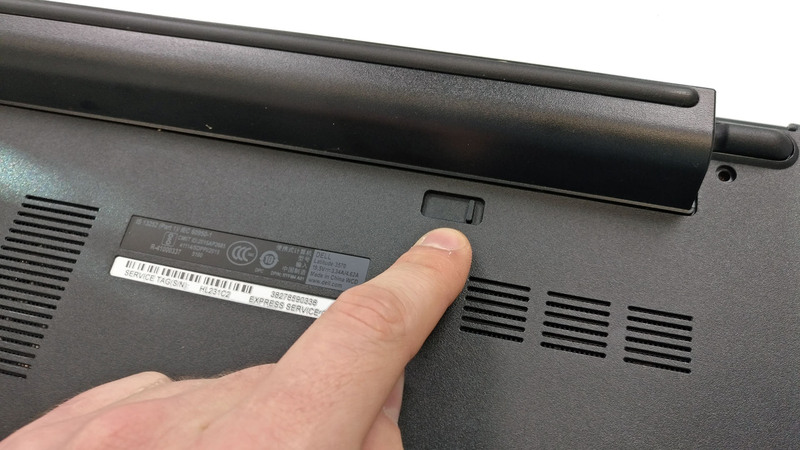 However, if you need to the cooling system or the whole motherboard, you will have to perform a full disassembly, which requires popping out the keyboard. 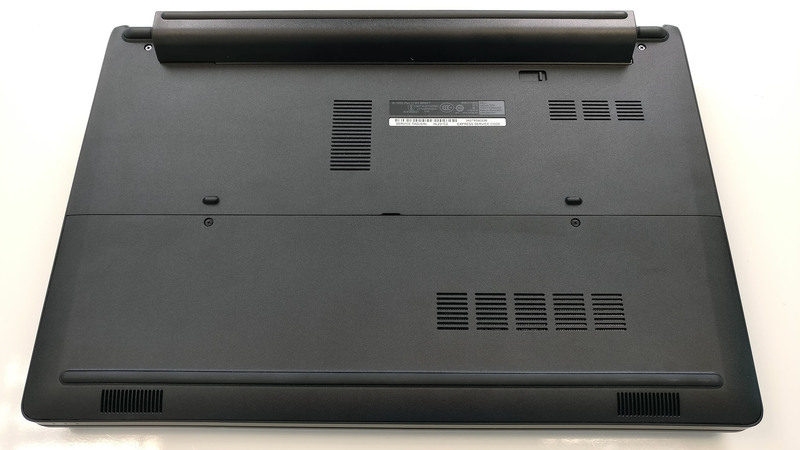 We got the unit featuring a Full HD TN panel manufactured by BOE with a model number C1JFR. With a 1920 x 1080 resolution, the panel scores a pixel density of 142 ppi and a pixel pitch of 0.18 x 0.18 mm. The display can be considered as “Retina” when viewed from a distance equal or greater than 60 cm. The notebook’s screen has poor viewing angles due to the use of a TN matrix. We measured a maximum brightness of 210 cd/m2 in the center of the screen and 209 cd/m2 as average. The maximum deviation is 6% in the upper right corner of the display. 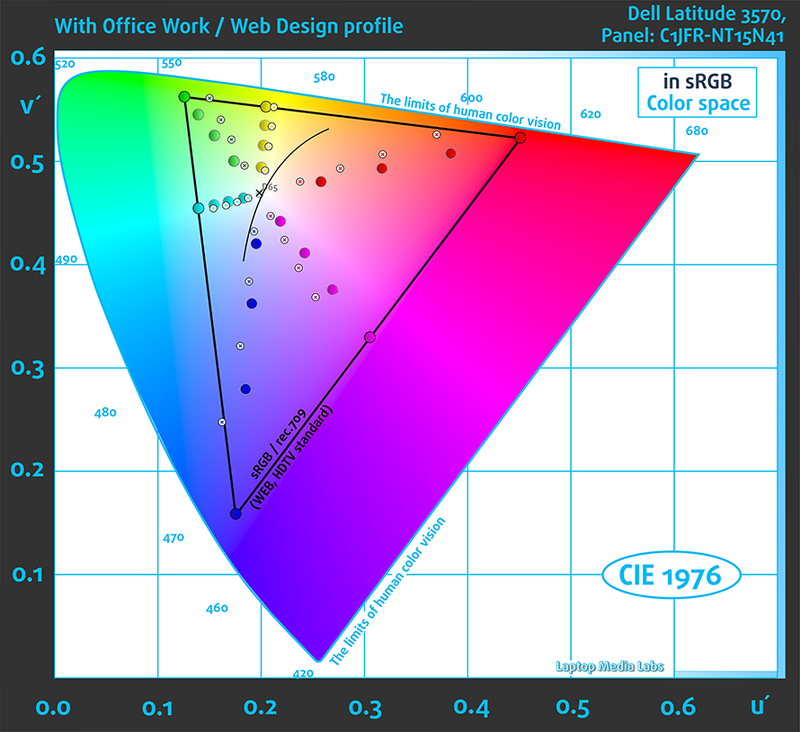 The color temperature is optimal measuring 6580K but the contrast ratio is extremely low – 250:1. We also measured the dE2000 color deviation on several parts of the screen and turned out to be 1.4, which is an excellent result. Values above 4.0 are unwanted. The display covers less than half of the sRGB gamut – 49%, which is slightly lower than what most notebooks at this price range can offer. We adjusted the luminance to match 140 cd/m2 and also to reach an optimal white point (D65) and gamma in sRGB mode. We recorded Fall Time + Rise Time = 11 ms.
Pulse Width modulation (PWM) is an easy way to control monitor brightness. When you lower the brightness, the light intensity of the backlight is not lowered, but instead turned off and on by the electronics with a frequency indistinguishable to the human eye. In these light impulses the light/no-light time ratio varies, while brightness remains unchanged, which is harmful to your eyes. You can read more about that in our specialized article on PWM. And we have some good news and some bad news. The bad news is that the display uses PWM for regulating brightness but the good news is that the frequency of the emitted light is pretty high at 28.6 kHz and may be felt by users with only extra sensitive eyes. Also, PWM is absent at 100% screen brightness. It’s hard to like a screen in the lower-end segment of the notebook market and it’s just as hard to criticize because OEMs often try to balance hardware and price. 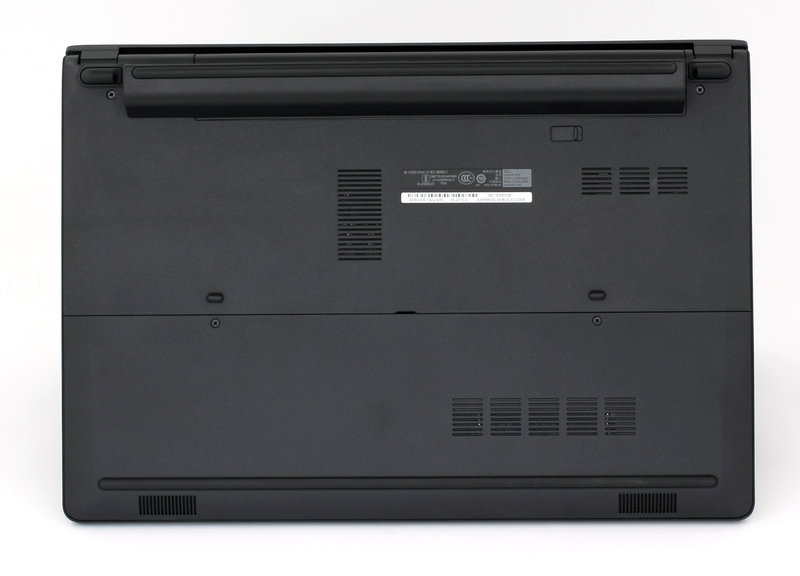 And almost always budget-friendly business notebooks have particularly low-quality TN panels. But in this case, the display quality is subpar in most aspects. The contrast ratio is really low (250:1), the maximum brightness is kind of okay for closed environments, the gamma curve is all over the place, and the sRGB coverage is also below average. On top of this, the screen uses PWM for regulating brightness and might get in the way of users with sensitive eyes. 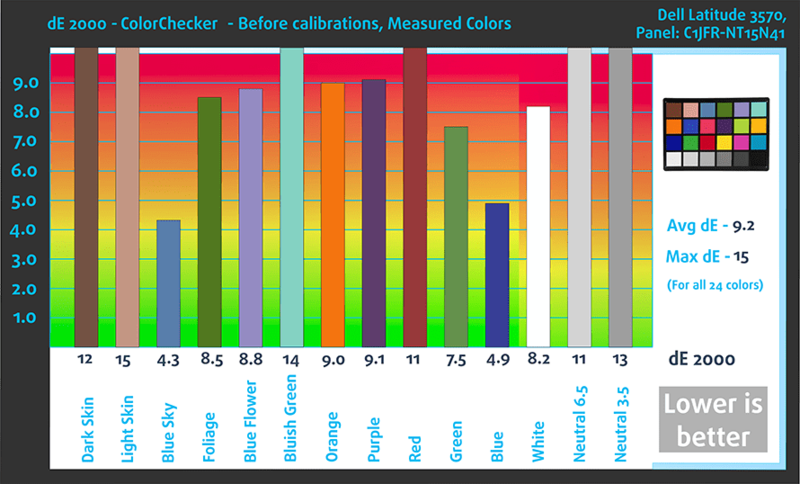 Luckily, our profiles improve some of the properties like limiting blue light emissions, eliminating PWM, adjusting the gamma and allowing for better color reproduction. Specs listed below apply only for the model we’ve tested and may differ from your’s. For testing purposes, we used a fresh install of Windows 10 (64-bit) and if you wish to perform a clean install as well, we suggest downloading the latest drivers from Dell’s official support page. 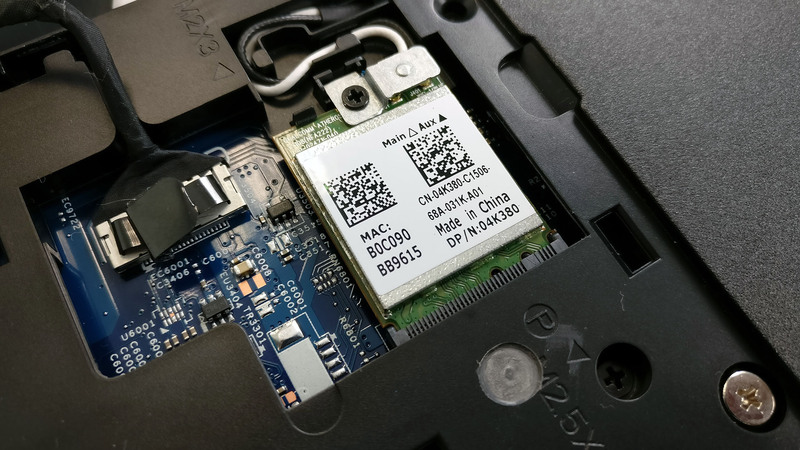 As we already said earlier in the review, the notebook is offered in two variants – with a 40Wh battery and a 66Wh unit that protrudes from the bottom (as in our case with the reviewed sample). Of course, the 66Wh configuration brings more than excellent battery life for the asking price and the proof is in our tests. We ran the usual tests using the same settings as always – Wi-Fi always turned on, Windows battery saving feature switched on and screen brightness set to 120 cd/m2. 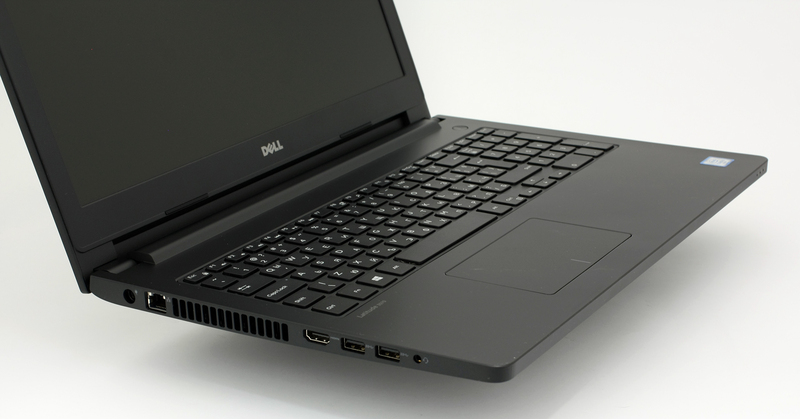 One of the best scores we’ve got on a 15-inch notebook – 621 minutes (10 hours and 21 minutes). We got considerably lower but still excellent runtime on the video playback test – 486 minutes (8 hours and 6 minutes). It’s quite unlikely that you will start a gaming session without being close to a power source, but it’s good to know that you can play for more an hour – 273 minutes (4 hours and 33 minutes). Intel Core i5-6200U is a 6th generation dual-core CPU. It is manufactured using 14 nm FinFET process, meaning it’s part of the Ultra-Low Voltage lineup.The CPU is clocked at 2.3GHz, but thanks to the Turbo Boost technology it could automatically increase its clock speeds up to 2.8GHz for a single core and 2.7GHz when two cores are functioning. It is designed using Intel’s Skylake architecture allowing it to have similar performance to Intel Core i7-5500U, which is part of the Broadwell lineup. The CPU boasts four logical cores and 3MB level 3 cache. It consumes 15W of energy and can operate at a maximum temperature of 100 degrees Celsius. 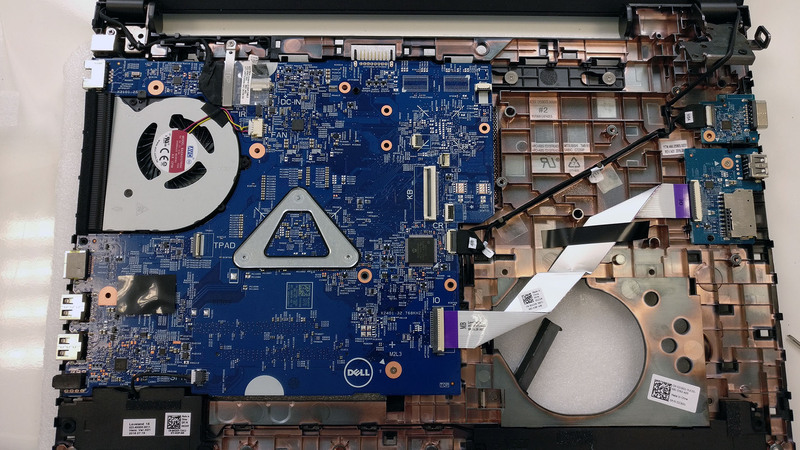 Here you can see an approximate comparison between the CPUs that can be found in the Dell Latitude 3570 models on the market. 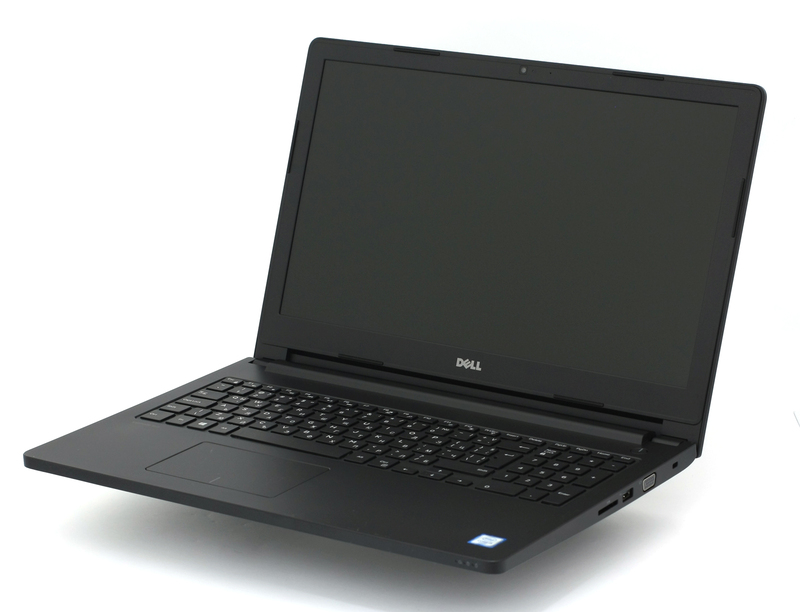 This way you can decide for yourself which Dell Latitude 3570 model is the best bang for your buck. Fritz is a chess benchmark that tests the computing capabilities of the CPU with various chess moves. 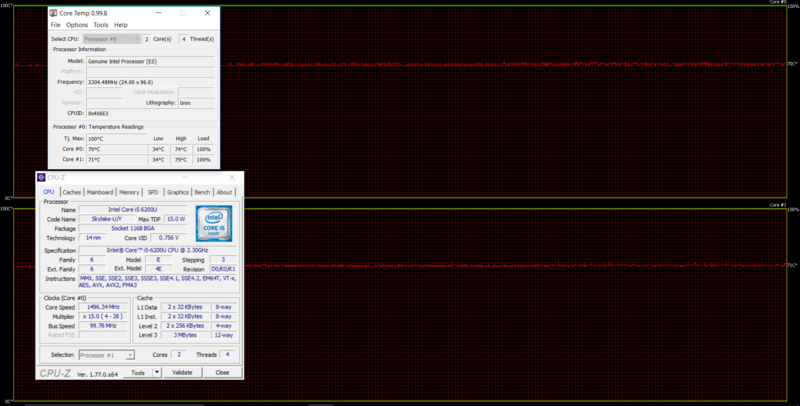 The Intel Core i5-6200U scored 5.480 million moves per second. In comparison, one of the most powerful chess computers, Deep(er) Blue, was able to squeeze out 200 million moves per second. In 1997 Deep(er) Blue even beat the famous Garry Kasparov with 3.5 to 2.5. This is not the best way to assess the cooling system from the user’s standpoint but it gives valuable information about the stability of the system as a whole in the long run. That’s because the general user won’t be able to reach 100% CPU and 100% GPU load for such long periods of time, yet we can see how the cooling design deals with the extra heat and how reliable this notebook might be after years of use. We kick things off with 100% CPU load for an hour. Temperatures remained stable and clock frequencies as well. The chip maintained maximum operating frequency for two active cores (2.7 GHz). After that, we turned on the GPU stress test as well. Temperatures didn’t change as much but the CPU downclocked itself so it can give enough headroom for the GPU to perform. Surface temperatures were also low with the only warm area around the main exhaust vent on the left. 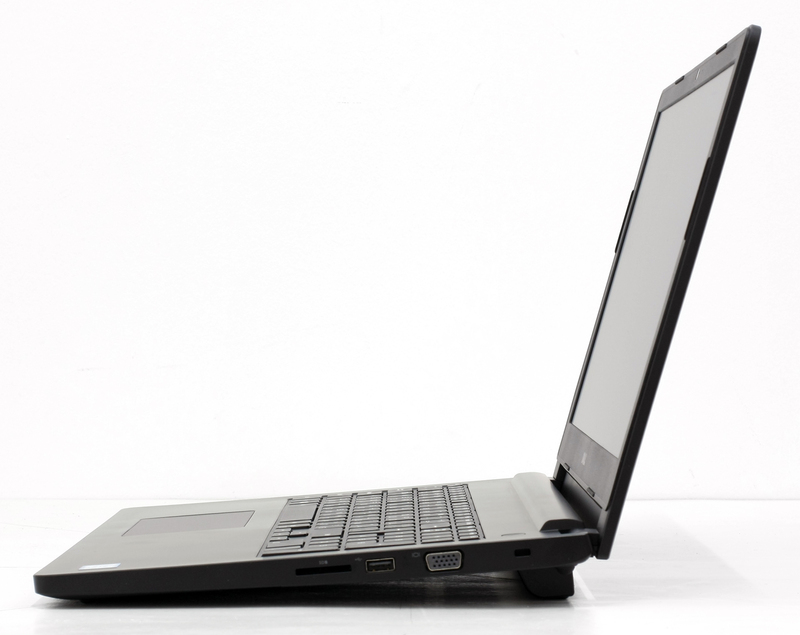 In some places, the casing of the laptop seemed less than optimal even for its price range but compensates with good dimensions and low weight – 2.06 kg. We can also say a few good words for the port distribution and the easy access to most of the upgrade options. However, the display’s quality is lower than expected even for a budget-oriented business notebook. It also features high-frequency PWM, which won’t be noticed by most users. Still, if you are generally looking for maximum endurance, the Latitude 15 3570 with 66Wh battery is probably the best one there is right now. It scored way above most 15-inchers we’ve tested and even the mighty HP ProBook 450 G3 can’t keep up with this juice. 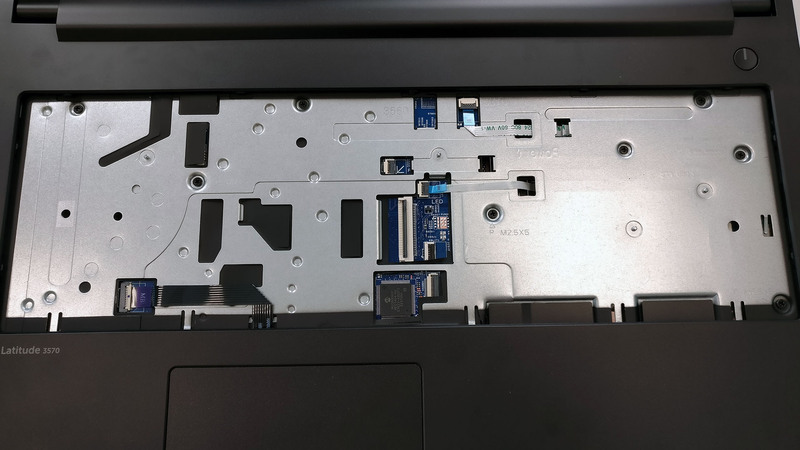 For everything else, though, we suggest opting for HP’s solution because it has better overall build quality with better choice of materials, one extra USB connector, supports M.2 SATA SSD and the display is marginally better. Not to mention the fact that the ProBook boasts one of the best input devices for this price range. The Acer Aspire E5-575G is also a must-consider notebook and even though it’s not business-oriented, it has a few lucrative features up its sleeve. Unfortunately, battery life isn’t one of them. just wondering under the video test what kind of file and resolution were you playing at? and did you have the volume set to high or was using a headphone? also did this model have backlit keyboard? and if so, was is turned on? We’ve stated above that it’s HD (720p) but as for the sound – we used the stereo loudspeakers volume set to a little below 50% (you can hear it but not too loud) and the keyboard backlight is always off during our video playback tests.